We went for graphite stock Global Li-ion at the end of August at a good price when it was near to the lower boundary of a trading range, which we had determined was a consolidation Rectangle, and so it has proven to be, for over the past couple of days it has broken out on strong volume as we can see on its latest 3-month chart shown below. The persistent strong volume on the “breakout drive” which started at the bottom of the Rectangle is bullish, as are the volume indicators, which this strong upside volume has driven higher, so it should not now react back into the Rectangle again, and if it does it probably won’t be too concerning as it will just mean that it has to do more work before it gets on with it. In view of what we have observed above, no action is required by holders, who should stay long. 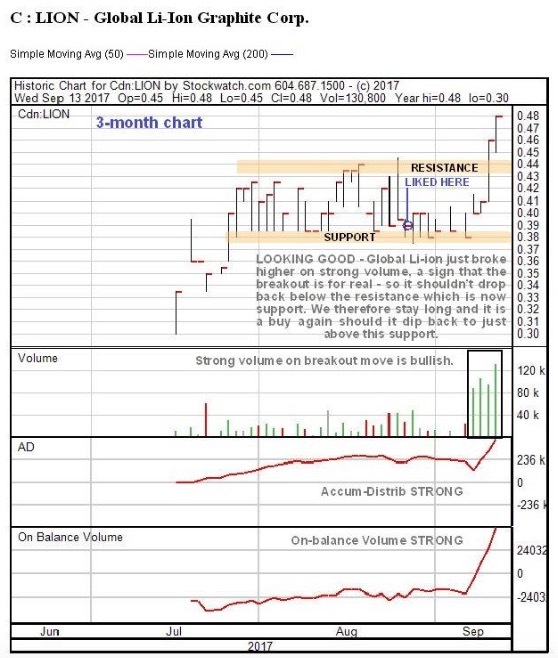 It is still rated a buy here after the confirmation of the breakout, although we would prefer to do any further buying on a minor dip back to the resistance level shown that has now morphed into a support level, i.e. in the C$0.45 area, although there may not be such a dip. Global Li-Ion Graphite Corp, LION.CSX, closed at C$0.48 on 13th September 17. Posted at 7.50 am EDT on 14th September 17.